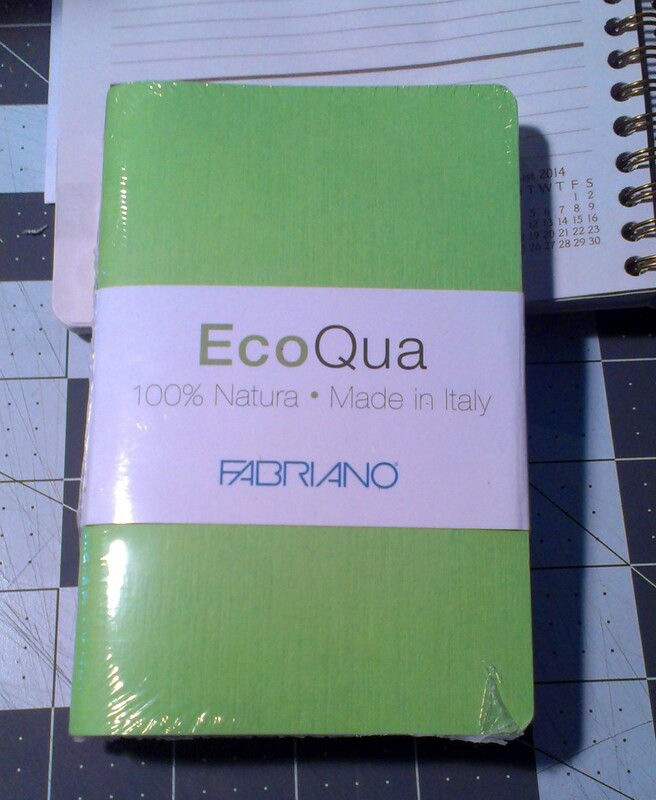 The pocket sized Fabriano EcoQua(EQ) notebooks have been around for awhile and I’ve just now gotten my hands on a 4-pack at my local AC Moore with a 505 off coupon. 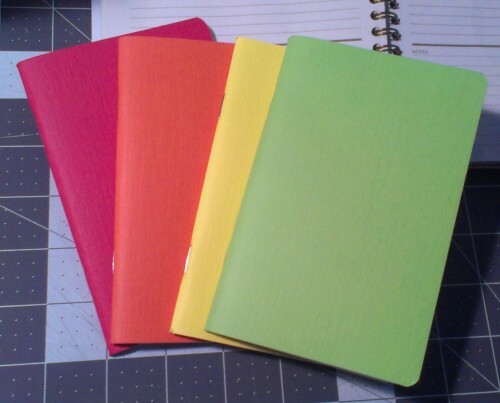 The regular price at AC Moore is $8.99 for 4 3.5×5.5 inch notebooks. They feature 64 pages (or 32 sheets) of creamy off white paper. The paper is lightweight 85gsm paper. The paper is amazing, smooth yet enough tooth that pencils perform well and smooth enough for fountain pens to glide over the surface. There was no feathering nor bleed through. It does take a bit for the pens to dry, but that should be expected with paper like this. Pencil smudginess was decent though not amazing. The pages are thin enough that inks and pencils alike have a lot of show through of the previous page, while this wouldn’t stop me from sketching on both sides it might be enough to deter some users. The second half of the book is micro-perforated. I’ll discuss that later. The covers are bright cheery colors with a linen imprinted finish. The cover weight is slightly heavier than a Field Notes and about the same as a Word notebook. 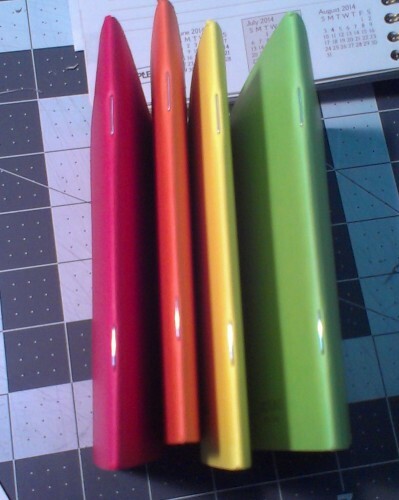 The corners are rounded, but just barely so. 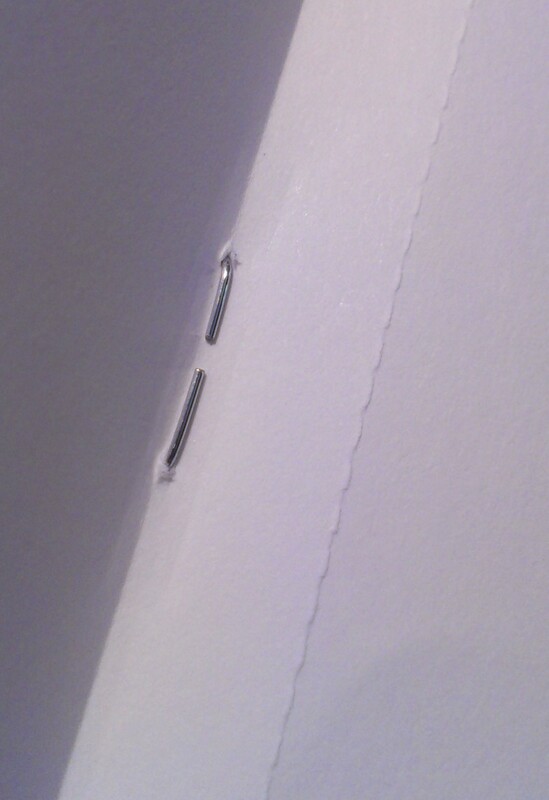 The book is held together with 2 silver staples, they seem robust enough. Each of my books at the spine feature a small tear. This can be caused by several things, first the blade on the shear could be dull, secondly the books weren’t clamped tight enough into the shear, thirdly the shear was over filled finally the shear was under filled. Most likely it was over filled and not clamped down properly. This happens pretty often when small pocket books are mass produced. It’s just something to make note of and to check for if you are neurotic about that sort of thing. I really love the paper and the bright covers. However, the micro-perforated second half of the book is a deal breaker for me. 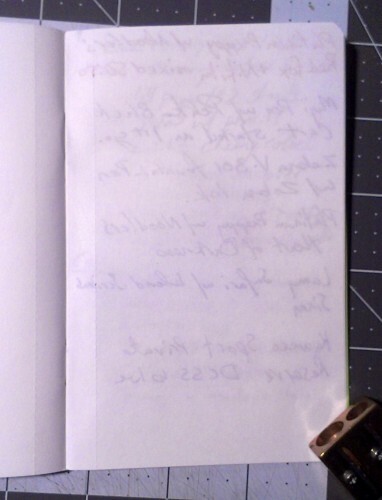 I cannot stand to have my sketchbooks micro perforated. If I want to remove a page I have an exacto, a ruler, and a self-healing cutting mat. Or I can use my cutter bee micro perforation blade to add my own perforations. I wouldn’t mind if the last 4 or 5 pages were micro-perforated, but perforations just mean that in my use those pages will fall out. 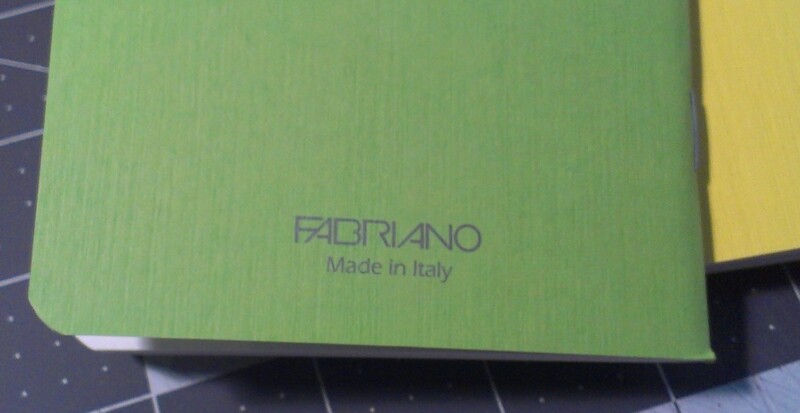 I joke that micro-perforation is Italian for “falls out with little effort.” If these weren’t micro-perforated they wold be right up there with my lovely BanditApple Carnet peewee sketchbooks. But with 1/2 of the sketchbook ready to fall out if I sneeze on them… Nope. I don’t know why it’s taken the big paper companies so long to get into the small pocket sketchbook game. Clearly it’s profitable and relatively easy to do. Canson delved into this territory with their pocket XL sketchbooks, which are really not that great but are wonderful for making a lot of dreadful sketches. I’m still surprised that with the success of Moleskine and Field Notes that all the big paper companies (hello, Strathmore, Borden & Riley, and Stillman & Birn) haven’t created a simple sketchbook like this. I’d buy a 3-pack of Stillman & Birn pocket sketchooks in no time. 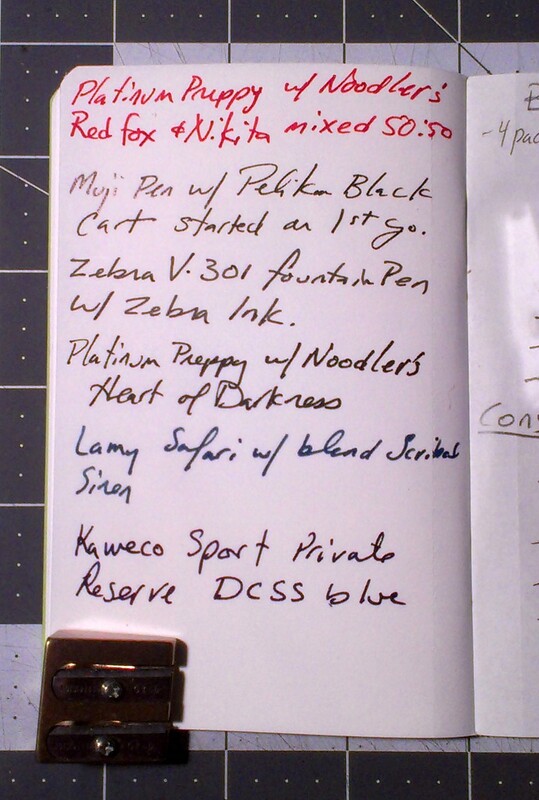 This entry was posted in Review and tagged ecoqua, fabriano, paper, pocket, sketchbook on 20140716 by leslie.